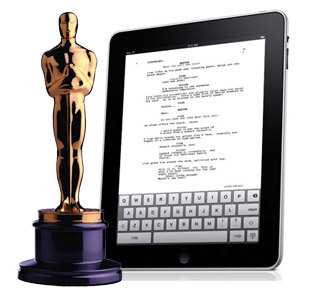 The iPad has been taking over Hollywood ever since Apple debuted the device in 2010. For example, Star Trek’s writers Robert Orci and Alex Kurtzman pitched their ideas for Star Trek Into Darkness using an iPad in their presentation. Many actors, including Julianna Margulies have publicly praised the “Rehearsal” app for helping them memorize lines for their roles. Gone are the days where productions had large paper shooting scripts to lug around. Want to make a last minute change to the script? You’ll need to print out 30 more copies. The iPad has also become a screenwriter’s dream. Have an idea when you’re on the go? You can easily capture it on your iPad. Did the Director order some last minute changes? You can fire them off at a coffee shop and have the revised scenes sent to the Director instantly. As a screenwriter who has owned an iPad since 2010, it really is a great writing device. I’ve tested nearly every screenwriting and movie-making app there is. These reviews are from my own personal experiences with each app. The one major drawback to the iPad (and iPad mini) is the lack of a good keyboard. The onscreen version is not meant for long time writing sessions. I use Apple’s bluetooth keyboard for long writing sessions. Another great idea is to get an iPad keyboard case. You can check here for all the latest keyboard cases that you can pair with your iPad. I really wanted to hate this app. Final Draft announced they were developing this app when the iPad came out, and it took them over two years to release it. On top of that? It’s expensive. It normally costs $29, although there are periodic sales that bring the price down to $19. That’s a lot for an app. But you know what? It’s the best screenwriting app, by far. In fact, it’s one of the best apps ever made for the iPad. Here’s why: other screenwriting apps assume that you use a desktop application for your main writing, and the app is only there for when you want to make a few notes. With Final Draft Writer, the whole functionality of Final Draft is built into the app. This is the first app that makes you feel like you could write an entire screenplay on your iPad. 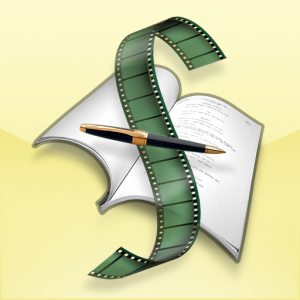 Scriptnotes – this is the big feature that the other screenwriting apps don’t have. It’s a feature that–if your screenplay is being developed–you will want to have. This enables different people: producers, directors, etc. to make notes on your screenplay. It also lets you keeps track of different revisions of your screenplay, so if you want to find a scene from your 15th revision, it will be there waiting for you. Character Highlighting – handy for keeping track of a single character in your script. All lines spoken by a particular character are lit up. 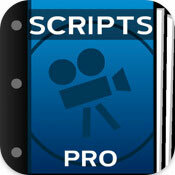 Scripts Pro was actually one of the very first screenwriting apps to become available for the iPad way back in 2010. The app was perfectly adequate as a ‘to-go’ app: you could write down a scene or two, email it to yourself, and then add it to your main screenwriting software at home. It also has a neat brown leather interface that gives the app an old-Hollywood charm. Well, it has massively revamped itself to become a true contender for the best screenwriting app on the market. It now supports all major screenplay formats: .FDX, .TXT and even .CELTX (even Final Draft Writer doesn’t have CELTX format support). It also syncs effortlessly with Dropbox, iCloud and Airprint, so you can easily pull up a script your working on, make some revisions and then have those changes waiting for you when you get home. The best part is that Scripts Pro now saves all your special features, including index cards, from your Final Draft formatted script. The only downside is that there is not script notes feature. When you are just writing your scripts for the first time, not having the script notes feature is no big deal. When your script is in production, however, Final Draft Writer’s extra feature becomes an essential feature. One of the best screenwriting apps doesn’t even advertise itself as a screenwriting app. Storyist is primalily considered novel-writing software, but it also has a screenwriting template that’s just as good as Scripts Pro and Final Draft Writer. The app can help you create submission ready manuscripts, including a template title page for when you submit your manuscripts to production companies/agencies. Since I’m also currently writing a novel, Storyist is my main writing app for the moment. If I get a script into production, then I will most definitely be using Final Draft Writer. -There are two views, Project view and Text view. In project view you can see the formatting elements of your script, and you can rearrange scenes in this view. The text view is the primary writing view. Features: character database, storyboards, headers and footers, re-ordering of scenes. Celtx refers to more than just screenwriting software. 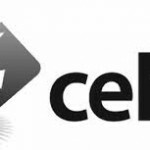 Celtx refers to a number of open-source pre-production tools. Some production companies only deal in open source software, so you may need to deal with it in the future at some point. While the desktop version of Celtx is free, the iPad app will cost you $4.99. It’s slightly cheaper than most other screenwriting apps. As with all open-source software, it can be maddening to get it to work. Linux no longer officially supports Celtx, so installing it on a newer Linux system has been a maddening process. One feature I did like the option to have a ‘parchment background’. The blue light from our iPads and iPhones can affect your sleep, so having a yellow background helps me get writing done between 10pm and 12pm without making me toss and turn all night. There’s no iCloud or Dropbox support with Celtx, but instead they have their own Celtx account that you can use to sync your scripts. This is an online account that you create and will sync all your scripts. You can also invite others to the account, if you’re taking a collaborative approach to screenwriting. Overall Celtx Script is as functional as ScriptsPro for writing your scripts. Where it loses points is in trying to bring you into the Celtx ecosystem, at the cost of convenience. Dropbox works seamlessly and many people already have accounts, so why not use it? It also doesn’t have FDX support, which is a real drawback. Features: More complex features like storyboards are stripped out in the iPad version, but when they will return when you open your script on the desktop version. Importing/Exporting Scripts: Only PDFs and Text files. In an industry where FDX format is everything, Celtx refuses to make it easy on us.